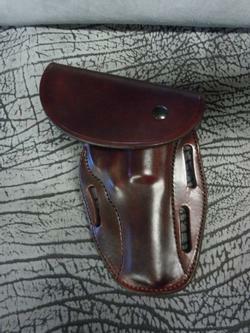 While an MP in the Army, Rob used an excellent full flap holster: John Bianchi’s M-66. 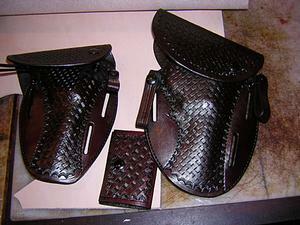 One of it's outstanding features was the pivoting flap. This allowed a quick draw of the 1911. It really helped to keep the gritty Chihuahua desert dust off of the 1911 duty gun, while stationed at Fort Hauchuca. Also, the mud and snow off of his 1911 while working and training in the forests and hills of Northern Europe. 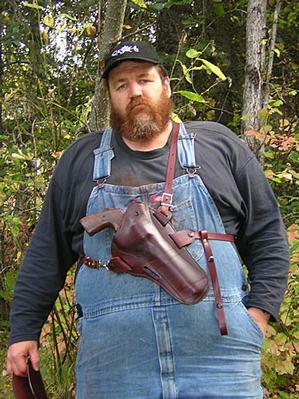 When Rob decided to build a full flap holster, he adapted the best flap design he knew of, to the best designed field holster extant (clears throat) The Sourdough Pancake...The Sourdough almost fully encompasses the the gun. About the only way dust and debris can get in on the gun is through the top, if you are not wearing a jacket or vest. Rob has rarely found himself out in the field hunting, without one or the other, but there are times. And, the CPS carries the gun comfortably when worn outside the coat. This is a full flap added to one of our Sourdough Pancake™. The removable flap flips up out of the way as you draw the gun. 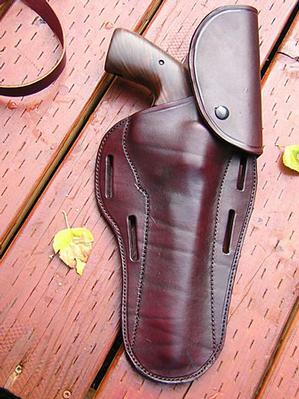 It adds protection for the grip frames and stocks of your pistol. If you do not see your exact gun model and /or barrel length, you will need to choose the closest model and use the "Notes" box on the credit card screen to tell us the exact gun model and barrel length.